Oase 1, a modern human mandible, was found in 2002 in the Peştera cu Oase, Romania. The age of this specimen has been estimated to be,37,000–42,000 years by direct radiocarbon dating. 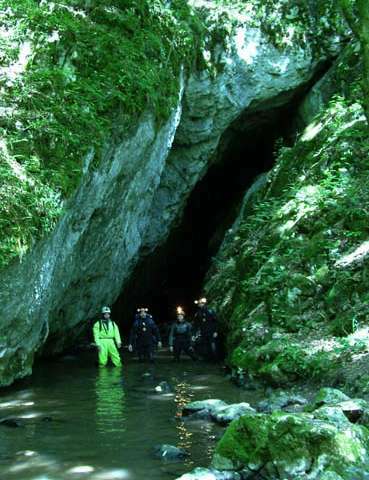 Oase 1 is therefore one of the earliest modern humans in Europe. Its morphology is generally modern but some aspects are consistent with Neanderthal ancestry. Researchers prepared two DNA extracts from 25 mg and 10 mg of bone powder removed from the inferior right ramus of Oase 1. Although the specimen contains small amounts of human DNA, they used an enrichment strategy to isolate sites that are informative about its relationship to Neanderthals and present-day humans, and discovered that on the order of 6–9% of the genome of the Oase individual is derived from Neanderthals, more than any other modern human sequenced to date. Three chromosomal segments of Neanderthal ancestry are over 50 centimorgans in size, indicating that this individual had a Neanderthal ancestor as recently as four to six generations back. "However, the Oase individual does not share more alleles with later Europeans than with East Asians, suggesting that the Oase population did not contribute substantially to later humans in Europe", said FU Qiaomei, lead author of the study. "The fact that the Oase 1 individual had a Neanderthal ancestor removed by only four to six generations allows this Neanderthal admixture to be dated to less than 200 years before the time he lived. 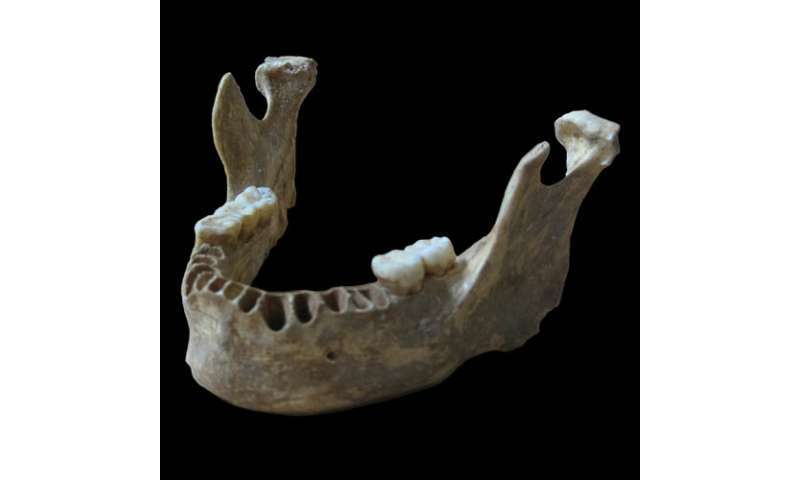 However, the absence of a clear relationship of the Oase 1 individual to later modern humans in Europe suggests that he may have been a member of an initial early modern human population that interbred with Neanderthals but did not contribute much to later European populations. To better understand the interactions between early modern and Neanderthal populations, it will be important to study other specimens that, like Oase 1, have been suggested to carry morphological traits suggestive of admixture with Neanderthals", said lead author Dr. Mateja Hajdinjak, Department of Evolutionary Genetics, Max Planck Institute for Evolutionary Anthropology. Did volcanic cataclysm 40,000 years ago trigger final demise of Neanderthals? RNA-mediated events link gene duplication and fixation of nutrient-dependent amino acid substitutions to chromosomal rearrangements and biodiversity in all vertebrates via the conserved molecular mechanisms of biophysically constrained protein folding chemistry that links a single amino acid substitution to differences between the cell types of gorillas compared to chimpanzees and humans. Reporting links between ecological variation and virus-driven nutrient-dependent ecological adaptations as if different primate species "evolved" or "mixed" exemplifies pseudoscientific nonsense. ~10% of the human genome still varies among different populations/individuals because the variations are nutrient-dependent and pheromone-controlled. See also: "The method appears particularly promising in archaeology, where it can reveal the diets and lifestyles of past cultures. Still, the technique has a long way to go before it reaches the maturity of paleogenetics, chiefly because methods to sequence amino acids lag behind DNA sequencing." Claims about biodiversity that do not include experimental evidence of how the diversity arose in the context of biophysically constrained protein folding chemistry will never be taken seriously now that Koonin has stated: "The entire evolution of the microbial world and the virus world, and the interaction between microbes and viruses and other life forms have been left out of the Modern Synthesis..."